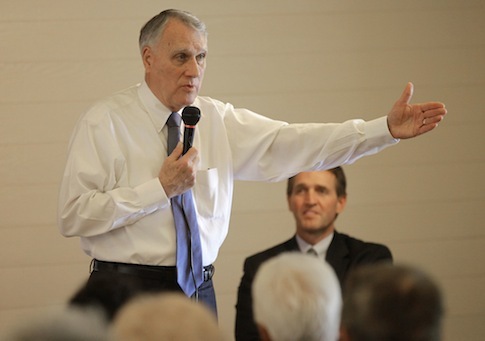 Former Sen. Jon Kyl (R., Ariz.) criticized what he described as a resurgent isolationist streak in Congress during a breakfast discussion at the Capitol Hill Club on Tuesday. Kyl, who led the 2010 Senate fight against President Obama’s missile reduction treaty with Russia, also discussed the American Internationalism Project he launched with former Sen. Joe Lieberman at the American Enterprise Institute. The project seeks to promote the principles of national security, economic prosperity, and American values. "You see [this isolationist streak] both in the House and in the Senate," said Kyl. "And this is why Joe [Lieberman] and I decided to work together on this project. We had seen this developing in our last couple years of our service in the Senate." Kyl said the unwillingness of Republicans to find a solution to sequestration-mandated defense cuts was "the most troubling evidence" that the party is moving away from its traditionally strong stance on national defense. "The lack of dedication to finding a solution to the problem on the Republican side convinced me that we had to begin to find an alternative way of discussing this subject because clearly we were not being effective in our conversation," said Kyl. Kyl took issue in particular with the views of Sen. Rand Paul (R., Ky.), a prospective 2016 presidential candidate and a new member of the Senate Foreign Relations Committee. "People like Sen. Rand Paul say ‘what the United States needs now is a foreign policy that is reluctant,’" said Kyl. "No. It does not need a reluctant foreign policy. You may decide at one point or another that you’re not going to engage in a particular situation either economically, or diplomatically, or potentially militarily. But you shouldn’t be reluctant about what your goals are, what your objectives are, and your willingness to commit whatever power, soft or hard, that you have at any given time, against the problem." Kyl added that Paul has "been very clear about his view that the United States, with regard to terrorism, should just have a position of containment, as if somehow you could contain these things." "Even containment has a concept behind it of doing something," he continued. "And what happens when you have to apply force to that concept of containment, if you don’t have the capability?" Defense hawks have not been effective in making their arguments to the American public, Kyl said. "We’re all caught in our past careers, a lot of us with the background of the Cold War," said Kyl. "A lot of us remember fondly Ronald Reagan and peace through strength—all the things that convinced us that we had to have a presence in the world to protect our interests. But those arguments aren’t winning the day now." The former senator said one purpose of his project with Lieberman is to help craft more effective language. "If we don’t find the way to convince and persuade the opinion leaders of today that this is the right course of action, we may find the price that we pay for that inability will be very great indeed," said Kyl. This entry was posted in National Security and tagged Congress, Joe Lieberman, Jon Kyl, Rand Paul. Bookmark the permalink.